Simple and easy, this winter squash recipe is a delicious side or replacement for pasta noodles. Drizzle with olive oil and season with salt and pepper, if desired. Bake for 45 minutes or until flesh is tender. 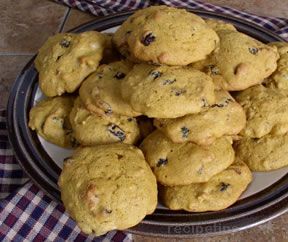 Once the squash is cooked, let it cool for 10 minutes so it will be easier to handle. Pull a fork lengthwise through the flesh to separate it into long strands. BOILING: Heat a pot of water large enough to hold the whole squash. When the water is boiling, drop in the squash and cook for 20 to 30 minutes, depending on its size. When a fork goes easily into the flesh, the squash is done. 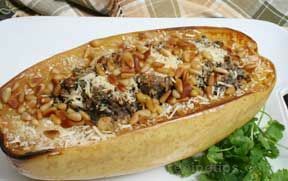 MICROWAVE: Cut squash in half lengthwise; remove seeds. 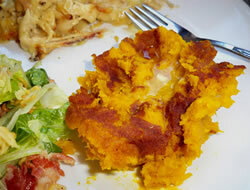 Place squash cut sides up in a microwave dish with 1/4 cup water. Cover with plastic wrap and cook on high for 10 to 12 minutes, depending on size of squash. Add more cooking time if necessary. Let stand covered, for 5 minutes. With fork "comb" out the strands. 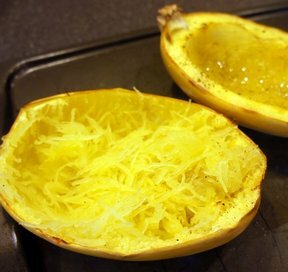 SLOW COOKER: Choose a smaller spaghetti squash (unless you have an extra large slow cooker) so that it will fit. Add 2 cups of water to slow cooker. Pierce the whole shell several times with a large fork or skewer, add to Crock Pot, cover and cook on low for 8-9 hours. "Not a huge amount of flavor, but I think if you messed with the seasonings it could be delicious. I roasted it and used it in replace of pasta for my spaghetti as I am trying to eat healthier. I didn't mind it at all and would definitely do this again."